Today, it was back into colouring. 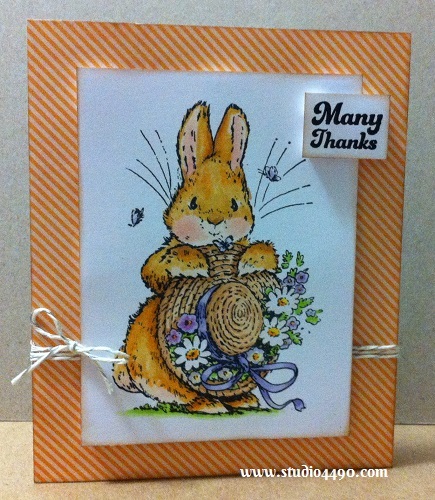 I had planned to make a card using the Penny Black Bonnet Bunny image I coloured on Sunday but I got sidetracked and kept colouring. lol So fun! Five images later….no card. Oops! I also swapped the colours I had used to colour the hat, with the colours I had used to colour the bunny – I quite like both looks. So I quickly whipped up this little card. I really didn’t have any ideas of how I wanted to complete the card so just kept it simple. Decided to use the oranges to complement the bunny. Next card may focus on the purple of the ribbon. Not sure yet…. Your fleet of bunnies (bunch of bunnies?) are just delightful in their respective colours and resulting cuteness! Darling to the nth degree! And speaking of things gorgeous…a handsome police officer caught your eye, you say? Hmmm…perhaps another saunter past where you chatted with him might be in order (hey, I’m all for ‘field trips’ when finding treasures are on the agenda!). It’s often said that ‘people come into our lives for a reason,’ so maybe the chat you shared is just a first step of the magical, marvelous universe bringing someone special your way (this fellow or maybe another). Maybe this was a ‘practice’ conversation…with more to come. Oh, I’m hoping so!! You are such a gem, deserving of ‘only’ the best!! Fingers crossed! Until then, though, keep crafting!! We’d miss you if some lucky guy started taking up all your time (although we’d understand!!). Have an excellent Wednesday! !